All sales are final — no refunds	or exchanges. 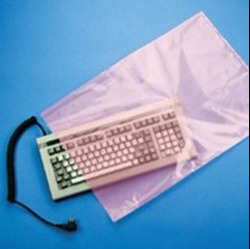 Pink Anti-Static flat bags provide excellent protection for sensitive electronic components. The pink anti-static material contains additives that effectively eliminate the hazard of static damage during packaging, storing and shipping. It has a surface resistivity of 1012 ohms/sq.in. and is amine-free, so it won’t damage sensitive polycarbonate boards. Bags can he heat sealed or taped shut. Copyright © 2019 Johnson Bag. All rights reserved.